Explosive volcanoes like Mount St. Helens in 1980, blow materials including platinum up and into the atmosphere. UC scientists use traces of platinum and chronometric dating technology to determine how far stratospheric winds have carried dangerous ash from ancient high magnitude volcanoes, some causing devastating climate change. UC interdisciplinary research team looks at platinum for clues to stay ahead of volcanic-related climate change. To get a glimpse for how future catastrophic volcanic events might alter our lives, scientists at the University of Cincinnati dug deep into the past to find new evidence for volcanic-related climate change. 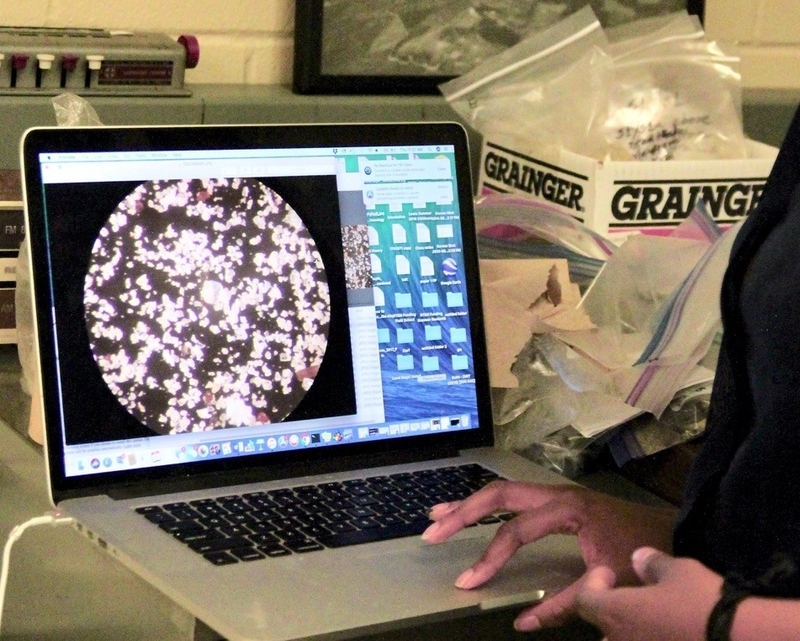 UC associate professor Kenneth Tankersley and anthropology graduate student Dominique Sparks-Stokes look for fine platinum particles among sediment samples from archeological sites affected by high magnitude volcanic events thousands of miles away. "Can you imagine a year or even a decade with no summer? This happened consistently throughout the past 10,000 years." For example, Tankersley explains the Eldgjá eruption of (CE 934) as producing so much dust in the atmosphere, it filtered enough sun and heat to lower global temperatures significantly for a couple of years. What ensued were severe winters contributing to famine, epidemics and loss of many lives. Over 900 years later a volcanic event on Krakatoa –– an island in the northeast India Ocean as part of the Indonesian archipelago –– caused Cincinnati to have an extremely cold winter and a very cool summer in the late 1800s. Not all explosive volcanic eruptions result in the global distribution of particle spread, such as the most recent Kilauea volcano in Hawaii. However, according to Tankersley, there is a definite link between significant changes in climate conditions outside regular climate cycles and the high magnitude volcanic events explored in this research. 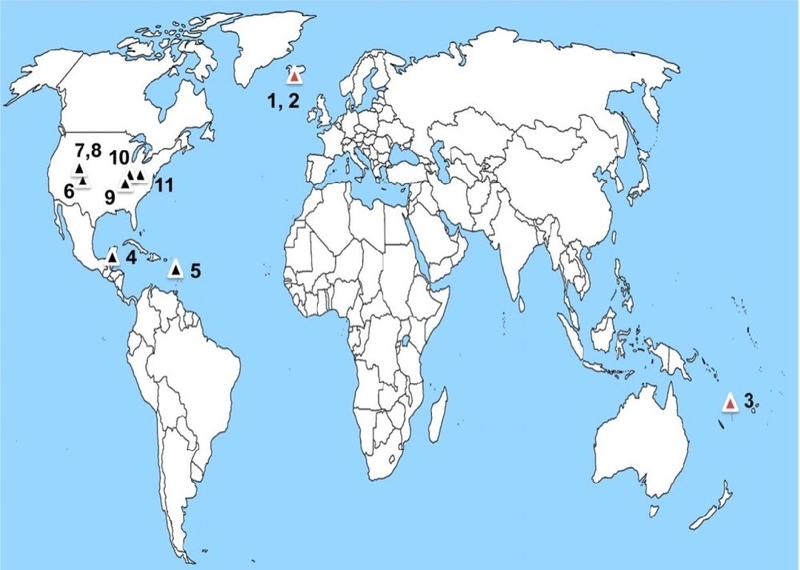 Map showing volcanic centers (red triangles) for late Holocene high-magnitude eruptions (black triangles) for Laki volcanic system (#1), Eldgjá volcanic fissure (#2) and Kuwae volcano (#3). Study sites for platinum (black triangles) include: Temple Reservoir tank, Tikal, Guatemala (#4); Nonsuch Bay, Antigua (#5); Chaco Canyon, New Mexico (#6); Albert Porter Pueblo, Colorado (#7); Wallace Ruin, Colorado (#8); Big Bone Lick, Kentucky (#9); Wynema, Ohio (#10); and Great Serpent Mound, Ohio (#11). A key player in this investigation is platinum. According to the researchers, the rare element doesn’t occur naturally on the Earth’s surface. It only occurs after a cosmic impact like a meteor, asteroid or a slice of a comet hits the earth. Or, as in this case, platinum is revealed when volcanic ash spews fountains of incandescent lava and cow-pie shaped molten rock bombs. The resulting ash clouds contain fine platinum particles, evidence for the far-reaching effects of major volcanic eruptions. The study looked at sediment samples from eight Western hemisphere archaeological sites in the Ohio valley, the American southwest, the Caribbean and the Maya Lowland in Guatemala. The interdisciplinary researchers from across UC’s campus and Kongju National University were able to successfully connect the radical climate change patterns from each of those sites to one or more of three high magnitude volcanic events including the Eldgjá volcano (CE 934) and the Laki volcano (CE 1783) in Iceland and Kuwae volcano in the island of Vanuatu off the coast of Australia (CE 1452). All three catastrophic volcanic eruptions happened within the last 1,000 years or the late Holocene –– the geological period we live in currently. 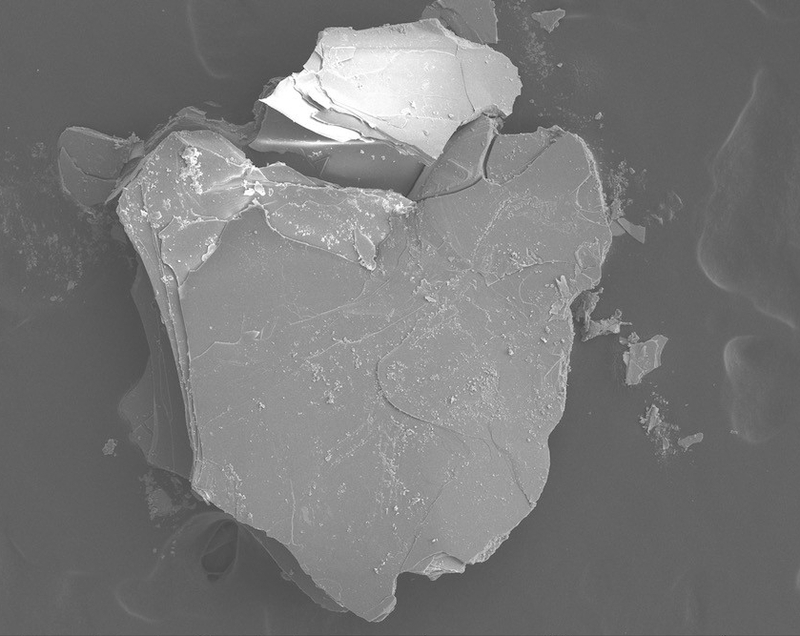 SEM micrograph of the volcanic mineral biotite, found in ancient pottery from the Hopewell site at Shawnee Lookout. Microscopic view of platinum particles found within sediment samples from ancient archeological sites. 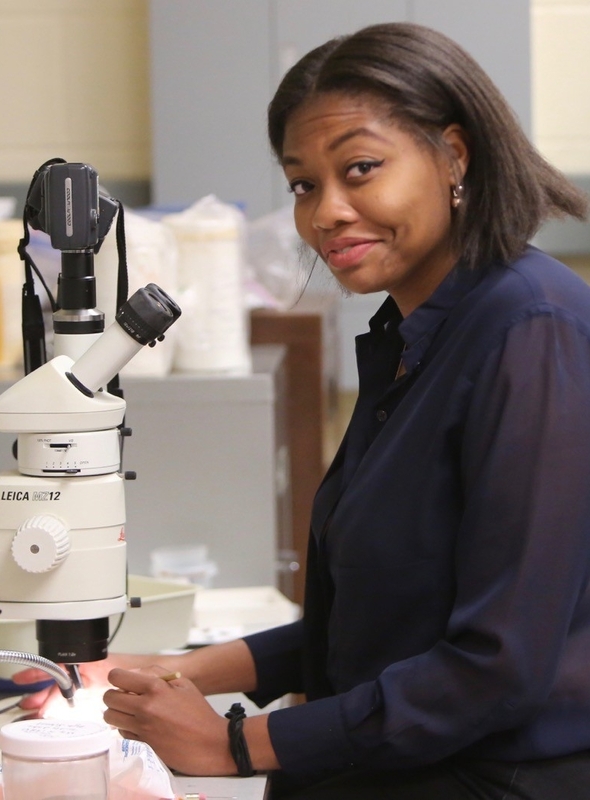 Among UC’s research team is first-year anthropology grad student Dominique Sparks-Stokes who retrieved deep sediment samples from two of the Ohio Valley sites and identified botanical remains for radiocarbon dating. After teasing out carbonized plants from the deep core samples, Sparks-Stokes and the researchers were able to count the number of carbon atoms –– a process Tankersley says helps geochronologists put a precise date on where they are within the core. In the lab, Sparks-Stokes works on trays filled with sandy colored dust and flakes. “See those tiny sparkling particles in this dust that looks like shiny sand? Much of that shiny material is quartz, feldspar and mica from volcanic dust preserved in the baked pottery. “We have perfect conditions in these pocketed and protected environments where winds have little effect from erosion,” adds Sparks-Stokes, referring to the sinkholes in Serpent Mound and the Wynema site in the Ohio Valley areas. 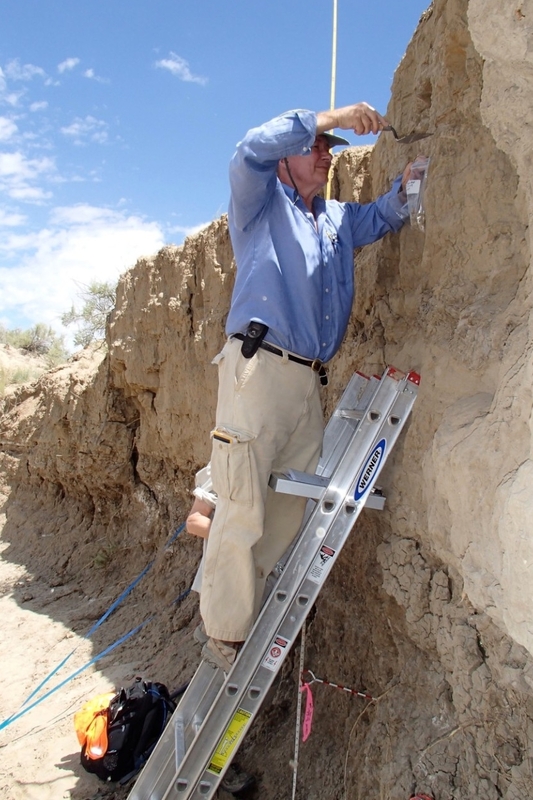 UC geography professor Nicholas Dunning collecting sediment samples from Chaco Canyon, New Mexico. 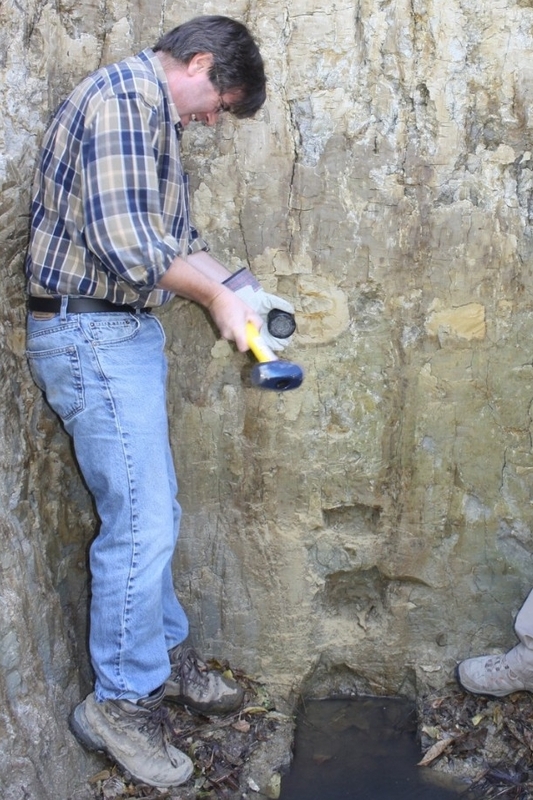 UC geology professor Lewis Owen collecting sediment samples from Big Bone Lick, Kentucky, archaeological site. 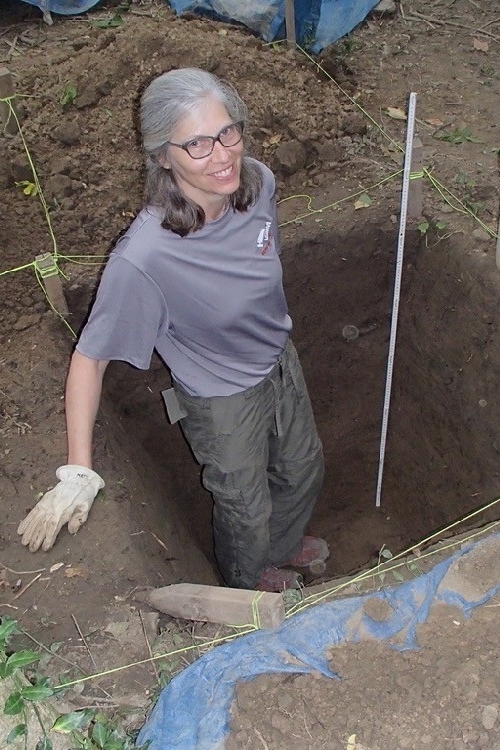 UC student Marcy Taylor collecting sediment samples from the Wynema archaeological site in Mariemont, Ohio. 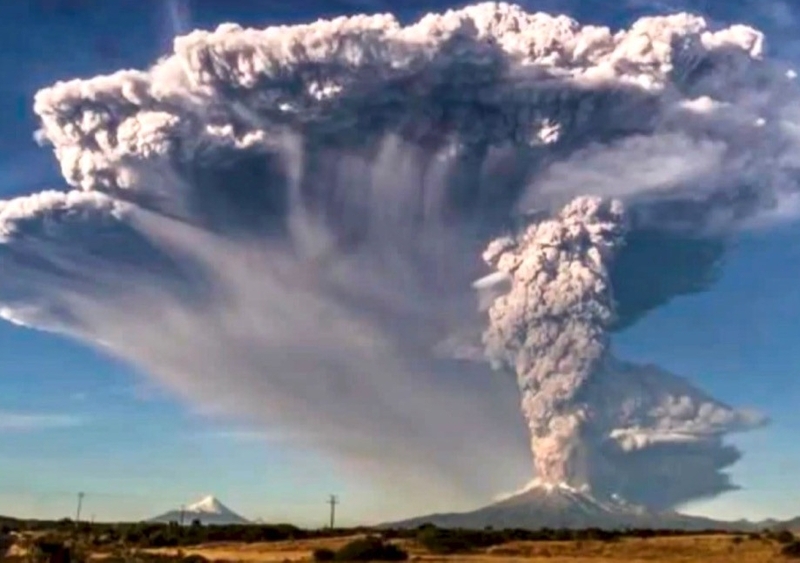 Regular volcanoes eject millions of cubic feet of ash and debris over an entire state. But as Tankersley points out, supervolcanoes can devastate a whole continent, and half of the Earth’s supervolcanoes happened in North America. 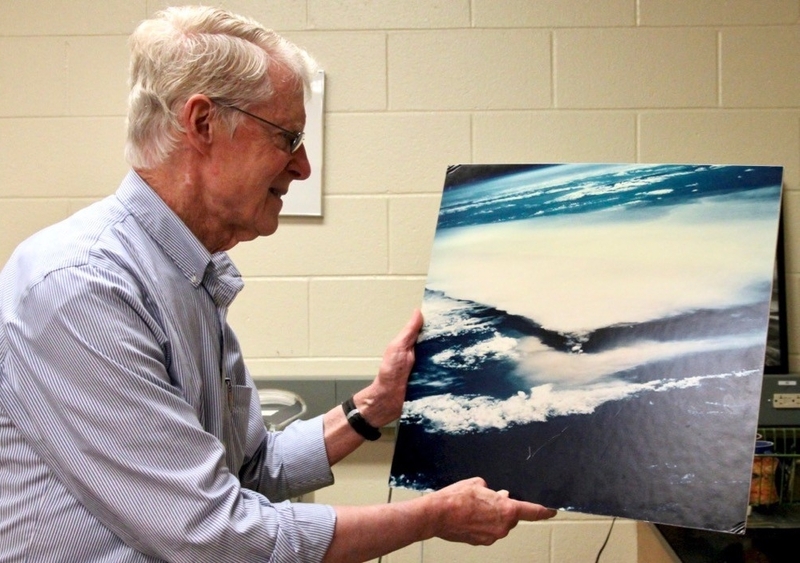 “Explosive volcanoes blow materials up into the stratosphere,” explains research team member Warren Huff, UC professor emeritus of geology. “The explosion releases sulfur dioxide gas, which converts into sulfuric acid aerosol droplets that then travel through the earth’s atmosphere on wind currents. Volcanologists currently find an active supervolcano brewing under 3,400 square miles of protected wilderness in Northwest Wyoming’s Yellowstone National Park. It has exploded several times between 2.1 million years and 830,000 years ago. "The concentrations of platinum from well-dated and well-stratified late Holocene sites provide an opportunity for more vigorous scientific evaluations of the impact of future high magnitude volcanic eruptions on climate change and society." UC professor emeritus of geology Warren Huff illustrates the stratospheric wind pattern from an aerial view of Rabaul volcano in Papua, New Guinea, 1994. Volcanic ash, containing mineral particles, sulfuric acid and dangerous gases travel through stratospheric wind currects, leaving their finger prints thousands of miles away. Kenneth Tankersley & Dominique Sparks-Stokes, Departments of Anthropology and Geology; Nicholas Dunning & Changjoo Kim, Department of Geography; Lewis Owen & Warren Huff, Department of Geology and David L. Lentz, Department of Biology, University of Cincinnati; Ji Hoon Park, Department of Geography Education, Kongju National University, Chungcheongnam-do, South Korea. This research was made possible with support from the Charles Phelps Taft Foundation, the Court Family Foundation, and the University of Cincinnati Research Council. The authors are especially grateful to Mark Varian, Bruce Bradley, Bradley Lepper, Kathy Loftus, Peter Siegel, Vernon Scarborough, the Antigua and Tikal research teams, the Crow Canyon Archaeological Center, Chaco Culture National Historical Park, National Park Service, the Navajo Nation, members of the American Indian Advisory Council and the Center for Applied Isotope Studies. 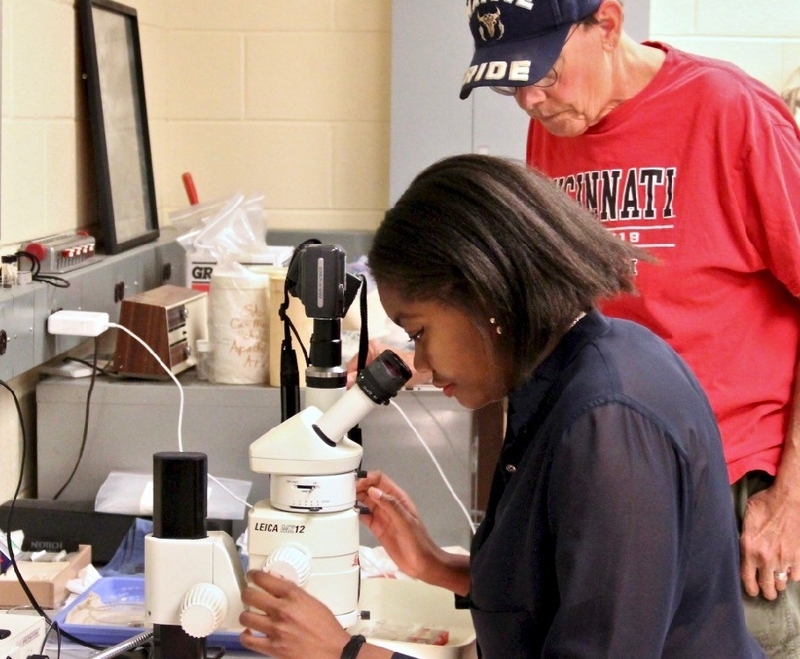 Research is a big part of the student experience at UC. UC's anthropology, geology, geography and biology research is improving our understanding of the world and demonstrates the value of UC's new strategic direction called Next Lives Here. Interested in improving the world through Earth science? Apply to UC's McMicken College of Arts and Sciences as an undergrad or graduate student.